Captain Token, the Magician! would love to help you create an unforgettable corporate event! 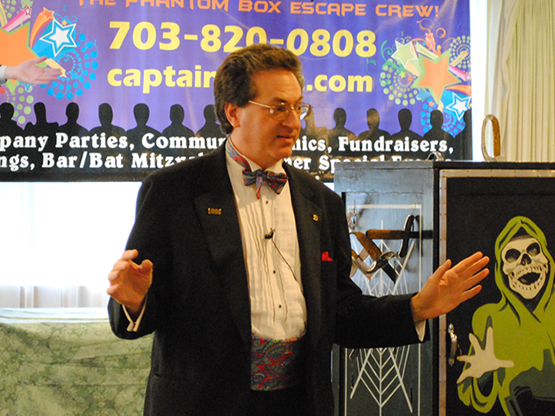 Entertain your company with a live magic show created especially for your employees’ enjoyment. From on-stage participation of personnel, to producing your CEO from thin air, to humorous mingling with our roving magic, Captain Token, the Magician! is sure to leave your staff with a smile. Captain Token, the Magician! provides incredibly flexible corporate event entertainment options for those functions where time or space (or both!) is at a premium. Our packages range from $200 for roving magic, to $4000 for a full blown stage production. From casual company picnics to formal holiday parties, all corporate events have unique requirements. Please call to discuss your magic and entertainment needs.